Whangarei (, alt. ; [faŋaˈɾɛi]) is the northernmost city in New Zealand and the regional capital of Northland Region. It is part of the Whangarei District, a local body created in 1989 to administer both the city proper and its hinterland from the former Whangarei City, Whangarei County and Hikurangi Town councils. The city population was estimated to be 56,400 in June 2016, up from 47,000 in 2001. The wider Whangarei area had an estimated population of 85,900 in 2015. The Whangarei urban area is spread throughout the valleys of the surrounding area and has several suburbs: Kamo, Springs Flat, Tikipunga, Three Mile Bush, Otangarei, Mairtown, Regent, Kensington, and Whau Valley lie to the north of the city. South and west of the city centre are Morningside, Raumanga, Maunu, Horahora, Woodhill, and the Avenues, and to the east are Riverside, Sherwood Rise, Onerahi, and Parihaka. The Māori iwi Ngāpuhi occupied Whangarei from the early 19th century, and the Te Parawhau hapū lived at the head of the harbour. Captain James Cook and the crew of the Endeavour were the first Europeans to contemplate the Whangarei Harbour entrance. On 15 November 1769 they caught about one hundred fish there which they classified as "bream" (probably snapper) prompting Cook to name the area Bream Bay. In the 1820s the area was repeatedly attacked by Waikato and Ngāti Paoa raiders during the Musket Wars. The first European settler was William Carruth, a Scotsman and trader who arrived in 1839 and was joined, six years later, by Gilbert Mair and his family. For the most part, relations between the settlers and local Māori were friendly, but in February 1842, all settler farms were plundered in revenge for transgressions of tapu. In April 1845, during the Flagstaff War, all settlers fled from Whangarei. Most of the original settlers never returned, but by the mid-1850s there were a number of farmers and orchardists in the area. From 1855, a small town developed, driven by the kauri gum trade. Today's 'Town Basin' on the Hātea River was the original port and early exports included kauri gum and native timber followed later by coal from Whau Valley, Kamo, and Hikurangi. Coal from the Kiripaka field was exported via the Ngunguru River. By 1864, the nucleus of the present city was established. Fire bricks made from fire clay deposits near the Kamo mines supported a brick works over several decades. 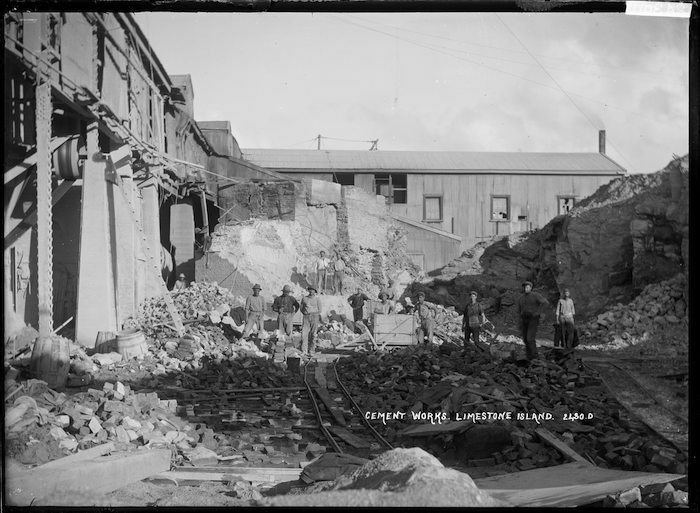 Good quality limestone was quarried at Hikurangi, Portland, and Limestone Island, and initially sold as agricultural lime and later combined with local coal to produce Portland cement at the settlement of Portland on the south side of the harbour. Local limestone is still used in cement manufacture but the coal is now imported from the West Coast of the South Island. Whangarei was the most urbanised area in Northland towards the end of the 19th century, but grew slowly in the 20th century. The district slowly exhausted most of its natural resources but was sustained by agriculture, especially dairying. Shipping was the main transport link until the North Auckland railway line reached the town in 1925, and the road from Auckland was not suitable for travel in poor weather until 1934. These terrestrial travel routes forced a rapid decline in coastal shipping but stimulated Whangarei to become the service centre for Northland. The population was 14,000 in 1945, but grew rapidly in the 1960s, incorporating Kamo and other outlying areas. In 1964, Whangarei was declared a city. Its population the following year was 31,000. The second half of the twentieth century brought the establishment and expansion of the oil refinery at Marsden Point on Bream Bay, the adjacent development of timber processing and the establishment of Northland Port, which is mainly focused on timber exporting. Building of the Hundertwasser Art Centre with Wairau Māori Art Gallery is expected to commence 2017 after the funding target of $20.97 million was raised by a volunteer team in time for a June 2017 deadline. A container port could follow, linked by rail to Auckland. 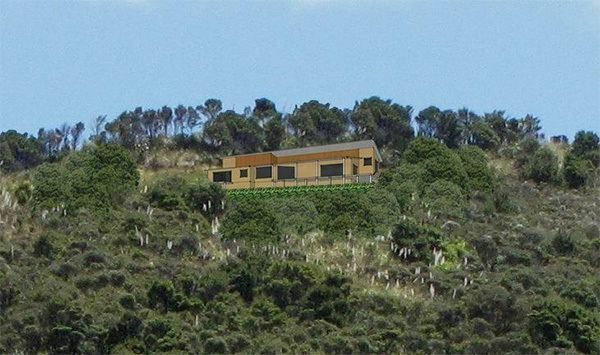 The extensive flat undeveloped land around Northport is a suggested solution to excess population growth in Auckland and the associated lack of industrial land. Mt Parihaka is a volcanic dome rising 241 m to the northeast of the city centre. It is about 20 million years old, and part of the Harbour Fault which also includes Parakiore near Kamo, and Hikurangi near the town of the same name. The dome is surrounded by the Parihaka Scenic Reserve. There is road access to the summit of Parihaka and walking tracks through the reserve. The dome is frequently called Mount Parahaki, but the original Māori spelling of Parihaka was confirmed by the government in 2005. 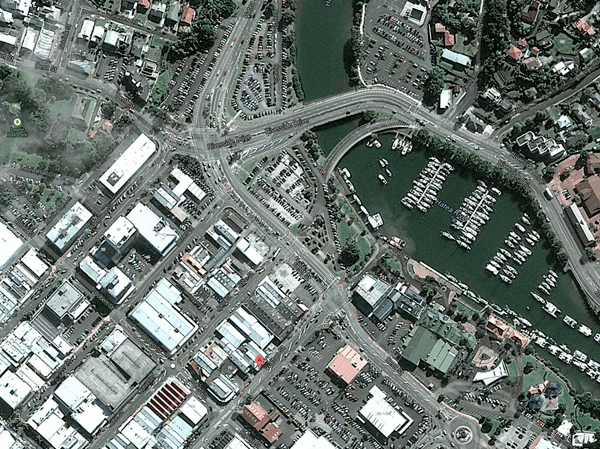 The Hātea River flows south through the city and empties into Whangarei Harbour. The river has a spectacular 26 m waterfall in Tikipunga, 6 km north of the city. Matakohe, or Limestone Island, lies in the harbour close to the city. Owned by Whangarei District, it is subject to ecological island restoration by the Friends of Matakohe/Limestone Island Society. Whangarei has a oceanic climate (Köppen Cfb). Climate in this area has mild differences between highs and lows. Summer days occasionally exceed 30 °C, and there is plentiful rainfall spread relatively evenly throughout the year. Using the Trewartha classification Whangarei is firmly a maritime subtropical climate due to its absence of winter cold. NorthTec, with its main campus located in Whangarei's suburb of Raumanga, is the chief provider of tertiary education in New Zealand's Northland Region. This institution offers a number of degrees, diplomas and certificates in a wide variety of academic, professional and technical fields. Their degrees are nationally monitored for quality and so can lead to postgraduate study at universities and other institutions. The student body of NorthTec consists of around 23,000 students studying either part-time or full-time. The University of Auckland maintains a campus in the city centre. There are also a number of private tertiary educational organisations, which provide technical and vocational training. There are several schools which offer secondary schooling education within the urban area. Most suburbs have their own primary school. Whangarei Boys' High School, a boys' secondary school with a roll of 1139 (July 2017). Whangarei Girls' High School, a girls' secondary school with a roll of 1365 (July 2017). These two secondary schools have a decile rating of 5 and cover years 9–13. Both schools opened in 1881. Kamo High School, which accommodates years 9–13. Tikipunga High School, which caters for years 7–13. Both of these are co-educational secondary schools serving the northern suburbs. Huanui College, a private secondary school just out of the urban area in Glenbervie. Te Kura Kauapapa Maori o Te Rawhitiroa. An all ages secondary School, also known as the only Maori school in Whangarei. There are two intermediate schools (years 7–8) in the urban area. Several primary schools offer education from years 1–8. Whangarei Intermediate is an intermediate (years 7–8) school with a roll of 639. Kamo Intermediate is a popular intermediate school serving the northern suburbs. Primary schools in the urban area include Hurupaki School, Kamo Primary School, Totara Grove School (formerly Kamo East School), Tikipunga Primary School, Otangarei School, Whau Valley School, Whangarei School, a contributing primary (years 1–6) school with a roll of 577, Maunu School, Horahora School, Morningside School, Manaia View School (formerly Raumanga Primary and Raumanga Middle schools, amalgamated), Raurimu Avenue School, and Onerahi School. Pompallier Catholic College (opened in 1971) is a Catholic state integrated co-educational secondary school (years 7 to 13) with a roll of 560 and a decile ranking of 7, located in the suburb of Maunu. It is the only Catholic secondary school in Northland serving the wider district. Saint Francis Xavier Catholic School, the city's Catholic primary school, located in the suburb of Whau Valley adjacent to the Catholic Parish. Christian Renewal School is a composite (years 1–13) school with a roll of 201. The school was established in 1993 and integrated into the state system in 1997. The school operates in the Christian Renewal Church buildings. Excellere College, a Christian school (years 1–13) located in the northern suburb of Springs Flat. The Whangarei Adventist Christian School, located at Whau Valley Road, has been operating for some 50 years and is the second oldest of the independent Christian schools in Whangarei. It was formerly called the Whangarei Seventhday Adventist School. Blomfield Special School and Resource Centre provides education and care to students between the ages of five and twenty-one years, and has a roll of 68. The school operates from five locations, four in Whangarei and one in Kaitaia. Whangarei is within the Whangarei general electorate and the Te Tai Tokerau Maori electorate. As of 26 November 2014 the current MP of the Whangarei electorate is Dr Shane Reti of the National Party. The current MP of the Te Tai Tokerau electorate is Kelvin Davis of the Labour Party. At a local level Whangarei comes under the Northland Regional Council of which the city is the seat. Whangarei is governed locally by the Whangarei District Council and the city is split into two council wards, Denby, which takes the northern suburbs and Okara, which takes the southern half of the city. The Northland Police District covers Whangarei which is split into two areas, Whangarei/ Kaipara and Mid/ Far North. Judicially, the town is served by the Whangarei District Court and is also the base of the region's only High Court. Highway 1 from Auckland to Cape Reinga passes through Whangarei. Highway 14 from Dargaville connects to Highway 1 in Whangarei. Whangarei is connected to Auckland by rail. The line carries freight only; public passenger transport is by long-distance bus. 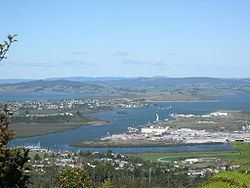 Whangarei Airport is located 7.4 kilometres (4.6 mi) southeast of the city centre, in the suburb of Onerahi. Northland Regional Council operates the CityLink bus service. This bus service runs six urban bus routes. In July 2013 a second road crossing of the Hatea River was opened, in the form of a bascule bridge. Whangarei Hospital (formerly Northland Base Hospital) is Northland DHB's largest and provides secondary specialist care to all of Northland and has 246 inpatient beds, it is based in the suburb of Horahora. Kensington Hospital, opened in March 2001, is a private healthcare facility. Whangarei falls within the Northland District Health Board and the Manaia Primary Health Organisation. The Whangarei Art Museum is located in the Town Basin. There are also artisan markets held at the nearby Canopy Bridge. The Hundertwasser Arts Centre is planned to be built on the site of the former Northland Harbour Board building. The Quarry Arts Centre is located on the edge of the Western Hills in the Avenues. Whangarei is home to the Northland Taniwha rugby union team, a professional side competing in the ITM Cup, the highest level of provincial rugby in New Zealand. They play out of Toll Stadium, the largest stadium in the region, which also hosted two matches during Rugby World Cup 2011. The city also hosted a match on 3rd June between a Provincial XV team (NZ Provincial Barbarians) and the British and Irish Lions during their 2017 tour. The football (soccer) club North Force who compete in the Lotto Sport Italia NRFL Division 1 are based in Whangarei. Whangarei's Field Hockey facility has hosted several international matches. Several hockey players from Northland have been selected for the Black Sticks Women since 2000. The International Rally of Whangarei is based in the region with competitors from Australia, India, China, Japan, South East Asia and Pacific Islands racing on dirt roads in the districts surrounding Whangarei. It is the season opening event for both the Asia-Pacific Rally Championship and the New Zealand Rally Championship and is New Zealand's second largest international motorsport competition, second only to the world championship event, Rally New Zealand. Whangarei Speedway attracts drivers from outside the Northland region. Northland is also represented at the highest national domestic level in Golf. The Northland rugby league team, representing the Northland Region in New Zealand Rugby League competitions, is based in Whangarei. They currently compete in the Albert Baskerville Trophy as the Northern Swords. Between 2006 and 2007 they were part of the Bartercard Cup, playing under the name the Northern Storm. Northland was originally known as North Auckland and has previously used the nickname the Wild Boars. Billy T. James, entertainer, comedian, musician and actor, was at Whangarei Boy's High School between 1962 and 1965.